Fix your slow WordPress website! 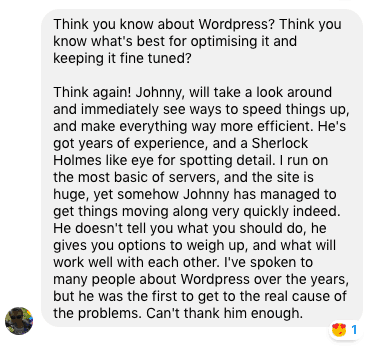 10+ years experience of speeding up slow WordPress sites. Speeding up WordPress sites is my addiction! If there’s even a 50ms improvement anywhere to be had, I will tell you about it. Having managed various sites from hundreds to millions of visitors, I believe page speed is important for any website, especially businesses. Much better user experience (especially on mobile), decreased server loads, and more conversions/sales. 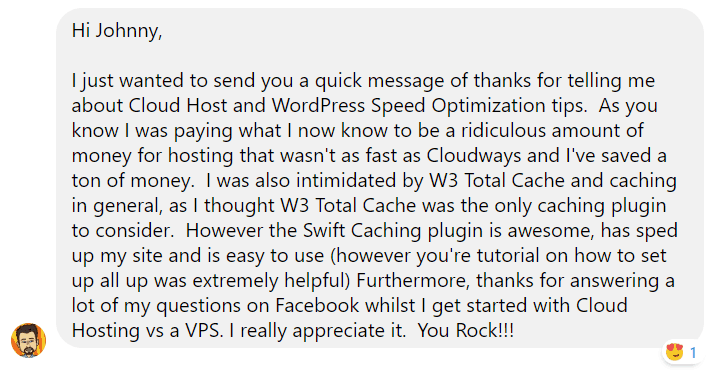 Respected community member on Facebook WordPress Speed Up Group. Work with theme/plugin developers on performance & UI/UX. Scroll below for TRUE test times, or see my happy testimonials. Why is your site so slow? Loading webpages is like pushing a car uphill. Either you increase the engine capacity (better webserver) or lighten the car (decrease code). The problem with many sites is slow servers and/or bloated code. One common tactic is installing more software (caching), adding more code in attempt to “lighten” existing code. But this often fails as you can only lighten the code by removing it, not by adding to it. Adding code increases the chance of conflicts…breaking your design or functionality. Decrease code, not add to it. Optimize for users, not test scores. Page loads must be INSTANT, 1 second is too slow for me! My sites are record-breaking fast because I manually optimize the code instead of relying on plugins and hacks. I set up caching only after everything is manually-optimized. Using caching first is only a band-aid fix that only decreases page weight and database queries on the cached copy of your site instead of the site itself. Doing it right not only gives you the best speeds but far less design/functionality issues in the future. Optimizing for users is still something that’s not understood. Many people don’t know any better, chasing that perfect A+ 100/100 Google score without understanding it’s implications. Those scores are simply guidelines, nothing more. 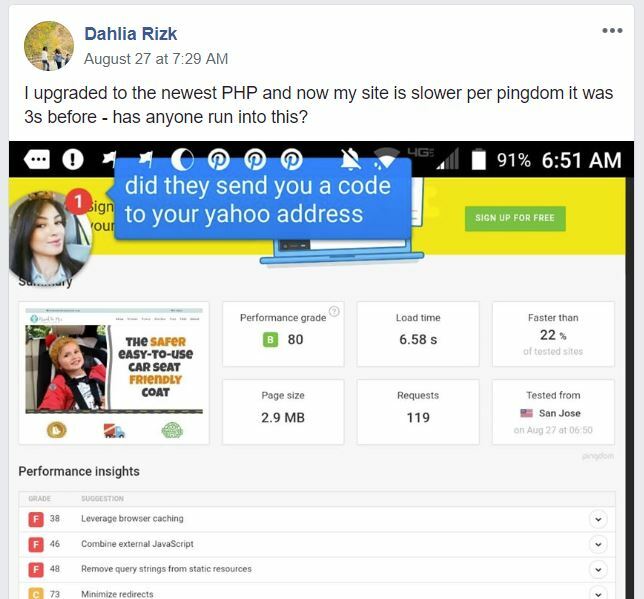 Hacking your site to score high can in fact make your site load slower for users and only further defeat the purpose of using those test scores. Why should you ignore those page scores? It’s because their grading scale is outdated and doesn’t reflect the latest web-server technology. I like instant page loads and nothing else. It needs to appear right away as if it was already on your computer. Any perceived “load” time is too long for me. It is truly magical and life-changing when your site is so fast like you never thought would be possible. Built and optimized hundreds of sites of all kinds. Familiar with all popular themes – AVADA, X, Newspaper, Flatsome, Electro, Astra, GeneratePress, OceanWP, Genesis, etc. Familiar with all pagebuilders – DIVI, Elementor, WPBakery, Oxygen, BeaverBuilder, Site Origin, etc. Server stacks – Apache, NGINX, LiteSpeed. Shared hosting – GoDaddy, BlueHost, SiteGround, 1and1, Hostgator, Inmotion, WiredTree, BellHosting, etc. VPS providers – Digital Ocean, Linode, Cloudways, Vultr, Scaleways, etc. Managed WordPress hosting – WPengine, Flywheel, Pantheon…yes, these premium services can be sped up, too! 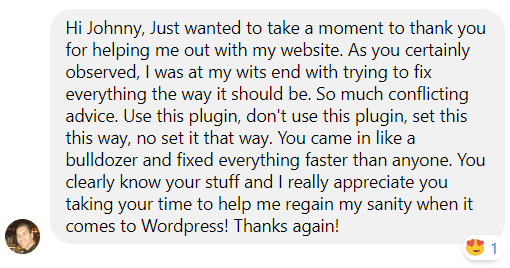 I’ve been doing this for a long time and very familiar with nearly all the popular WordPress themes and plugins of the past decade. 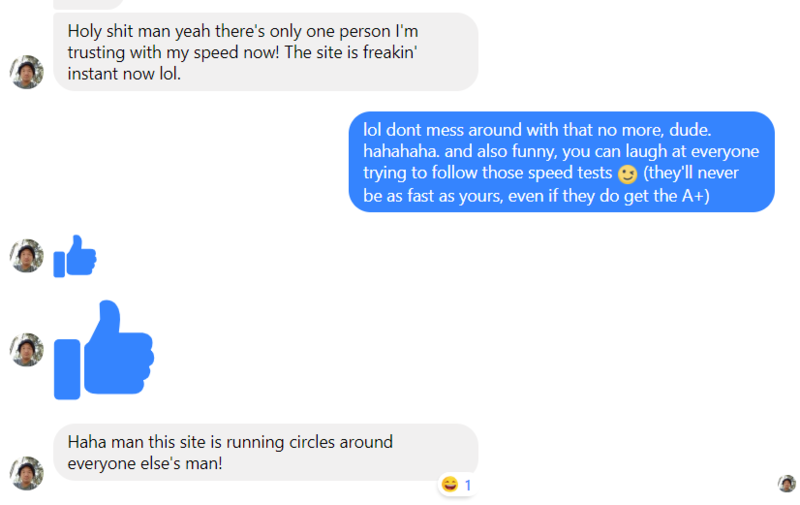 I can tell you right away (even without logging in) if your site can be sped up or not. There were even instances where a site felt too fast or too slow to be sped up, and yet I was later surprised how much speed I still got out of it. General speed consultation so you can handle other optimizations yourself. Webhost migration – many issues come from poor webhosting, I can migrate you if you’d like to try another host. *** JUNE 1st, 2018 – I am officially overbooked for the next 2 months and cannot handle any more clients. Anyone incoming requests will get free advice and referral to someone else. Or if you absolutely want your site to be optimized by me, the temporary price is $500 until I can get all my projects under control. no stone left unturned, I optimize EVERYTHING! Super bloated site on awful shared hosting. Bloated WooCommerce site with pagebuilder. Sliders/carousels/animation elements, many 3rd party scripts and social calls. Took me a good couple hours trimming stuff out, and even resolving mixed content issues with old http links. The site is actually in Canada and loads faster for their local visitors. In real-time, loads went from about 8 seconds per click down to almost instantaneous. Incredibly laggy site. Had a booking system with tons of images and scripts. I was able to bring down the load times within a few hours of work. I’m always grateful to see happy customers and people who appreciate my work. Some jobs do take forever. 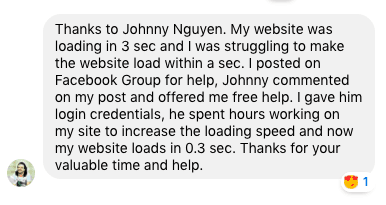 Johnny is a very experienced and helpful WordPress expert who increased my site speed exponentially. My webpage went from 10-13 seconds on every click down to now instantaneous, even on my phone! The site is crazy fast, holy sh*t, insane. I had no idea my site could be this fast, it’s 1000 times better. This was a free job that I did. He had a simple site that was already built efficiently but still took forever to load. I optimized his server configuration, setting up new modules and implemented a special caching solution just for his scenario. It goes to show that even the leanest sites can be optimized so much further. Slow WooCommerce site using minimal theme but awfully slow web server. This was more of a server-performance tuning rather than website-tuning. I was having a hard time with different VPS hosting providers. Support (at Inmotion VPS) was horrible and almost non-existent even though I was paying high prices. My sites were slow. The load times were between 3-5 seconds consistently, and that was with caching plugins and CDN’s enabled. I was at the end of my rope, and then I met Johnny. I was a little nervous at first but now I am glad I made the shift and have no regrets. At the time I transitioned three live sites, and one of them was running live Facebook ads. And yet, the move was seamless with his help. I didn’t miss a beat. I was blown away by how helpful he was. He went above, and beyond, and I tell you this, he has a friend for life, not just a customer. He pretty much saved my business. Where all the other providers failed, he delivered. All my sites are now on his stack. Once he optimized the themes I was using, my load times went from 3-5 seconds to under 1 second, and that was without caching. Once we stabilized, he added caching back in, and wow! My load times dropped to under 800ms consistently for my main page and for my store it fell to 650ms. I am completely blown away by the performance and support offered by his service. When you need help, he is there for you when you get stuck. 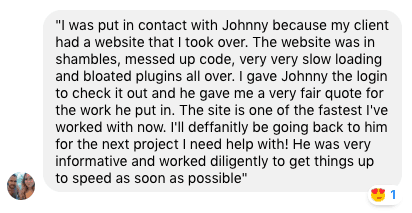 If you want someone that knows what they are doing inside and out, and that can take your site to the next level, I would highly recommend Johnny. This one was just a free community service. He had an awfully slow server, inefficient theme, and heavy Google Maps script loading right on the home page. I couldn’t make his site as instantaneous as I’d like but was able to improve the real world speeds by a lot. Don’t be fooled by the “7.1s” loaded time. His onload time felt more like 2 seconds which was a huge improvement to his 10+ onload times before. This was a miracle job. He was running off a $3/month hosting plan at InMotion Hosting. You know the drill…huge busy site, pagebuilder, tons of CSS/JS scripts, and even plugins to add more custom CSS/JS on top of that. Then image galleries, forums…it was quite a mess, about 780 pages in total. Despite all this…I got his bloated site to load almost instantly! He had a nice tech blog with lots of traffic. 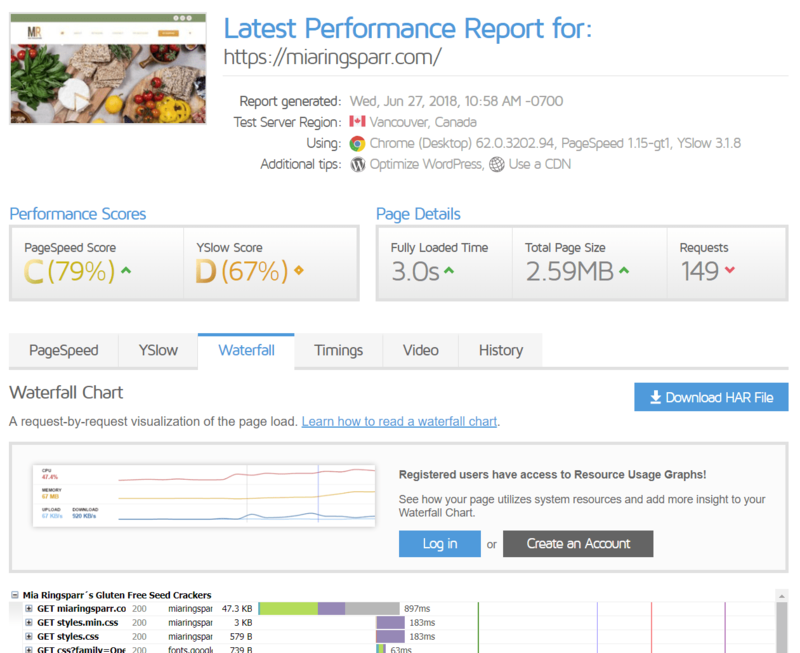 Was relying on multiple “performance” plugins like SiteGround’s built-in SG Optimizer and some others but the site was still slow and unresponsive. I switched some things around and right away, his site got snappy. Hooray! Massive project where we consolidated a client from 3 over-priced slow VPS servers into one VPS. He was getting terrible performance and support from his previous host, fed up with frequent slowness, downtimes, and excuses despite paying nearly $700/month. It also didn’t help that he had over 6 million hits/month and some bloated sites. 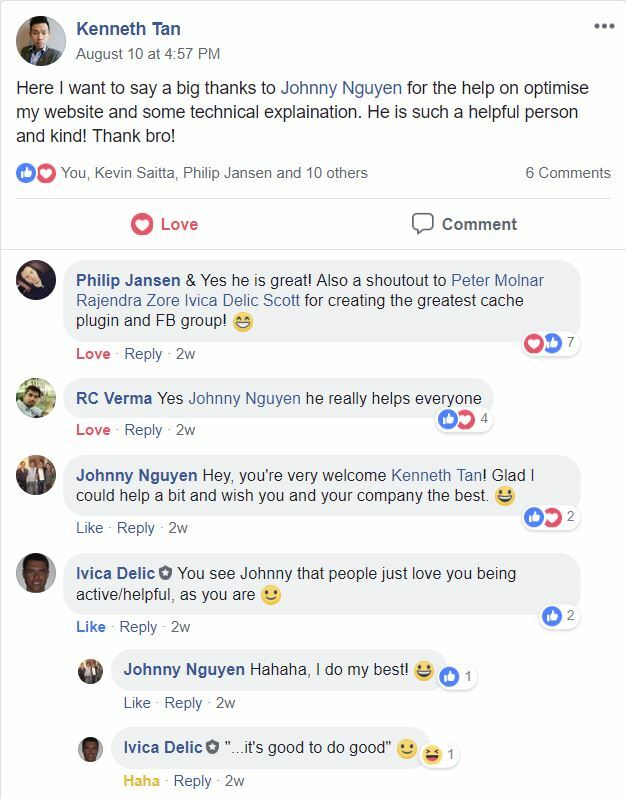 He couldn’t believe that we could manage all his traffic with one small server so we had to reassure him again and again that he did not have to pay us any more money. Being that we had a successful speed-up project with us from before, he decided to believe in us again. We migrated him over to a managed VPS with all our special tweaks. The performance difference was night-and-day AND we saved him hundreds of dollars every month. Before he had 3 servers that could barely handle the load and now with only one server at a fraction of the price, his server handles all traffic at blazing fast speeds with only 25% CPU utilization. Job well done. His site was the typical nightmare scenario – slow bloated pagebuilder, a hundred image galleries, not one but TWO lightbox scripts (what on earth?! ), forums, member pages, and half a dozen other CPT’s…all running on a $3/month shared hosting account at InMotion Hosting (one of the worst webhosts out there). He had already tried a dozen things and kind of jaded by caching attempts but never to fear, we turned this nightmare into a miracle. Took a dozen tries but I finally got the site to load FAST, yes—all 700 pages of it—and yes, all from his crappy $3/month InMotion shared hosting account. Super slow load times before. This was with LiteSpeed server using LiteSpeed Cache plugin. He didn’t know how to configure it correctly. 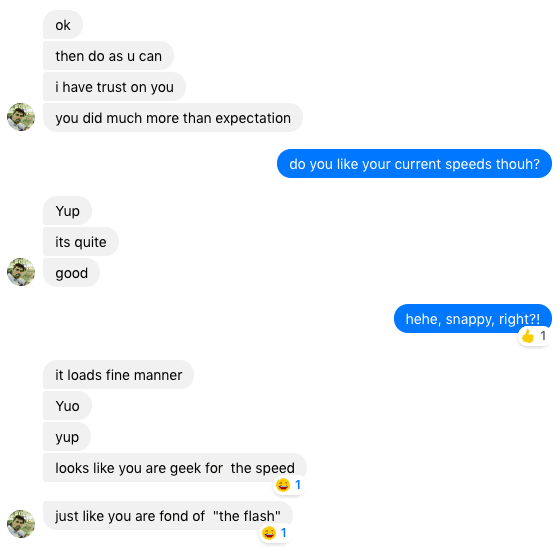 Instant speed improvement right after I re-configured his cache plugin. Notice how his initial http request went from nearly 10 seconds down to below 1 sec! Most of the site loaded immediately with only 3rd party assets dragging it out to 3 sec (but unnoticeable to users). This was a fun little project for me. This client was confused by a really slow site. She had already tried to her optimization using cache plugins and merging. I reconfigured her caching, made tweaks to her site, and put her on my much-faster webhosting service. 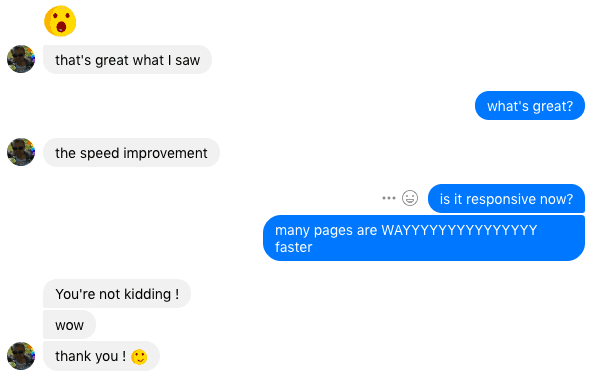 She was shocked how much difference every little tweak could make and happy for a much faster site. Ethan had what seemed like a clean photography site, which was already pretty lean and fast, but he insisted on breaking records. He had already tried all the cache plugins and tried clicking every feature/setting on his own. Some of the features he enabled even made his site slower. I came in, and within 10 minutes he was already running much faster. An hour or so later, his site was really blowing everything away. As fast as it was before, it got even faster. The site LOADS INSTANTLY now and the photos are still high-quality. Good day! This local hair salon was crumbling with bloated scripts from pagebuilders and random little plugins they installed. I configured, reconfigured their theme and plugins, cleaned the database, dequeued unnecessary scripts and stylesheets, did even more housecleaning, and VOILA! 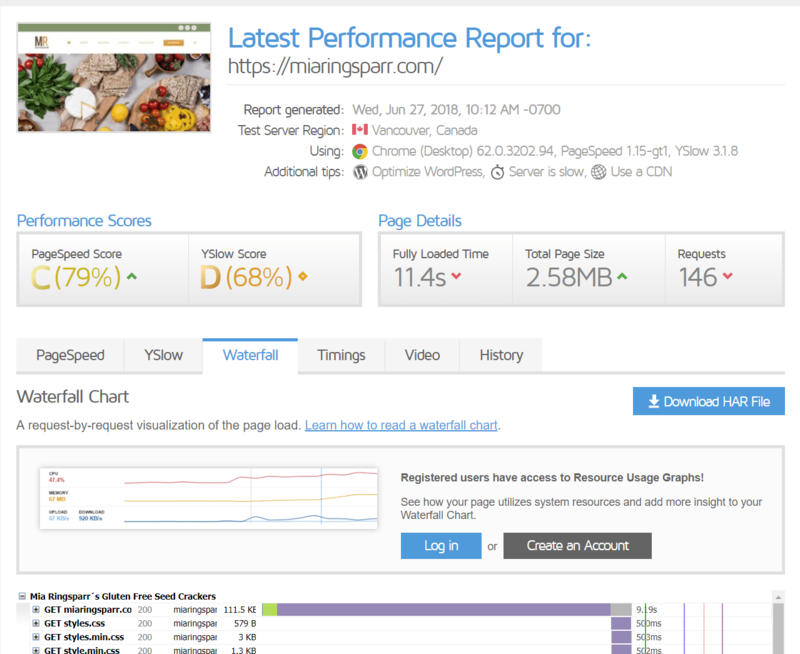 The page load is faster on tests but in real world times, it feels much MUCH faster. It’s instant now!